In order to expand the genetic code of pro- and eukaryotic cells, we are adding orthogonal components to their protein biosynthetic machinery. 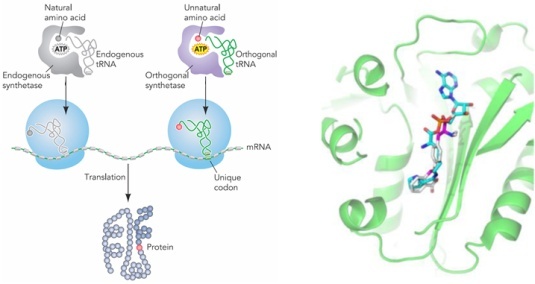 Specifically, an orthogonal tRNA is added that is aminoacylated with the unnatural amino acid by an orthogonal tRNA synthetase. We are specifically engineering the synthetase enzymes to accept only the unnatural amino acid as a substrate. The tRNA then delivers the amino acid into the growing protein polypeptide chain in response to a re-programmed amber stop codon. Using this methodology, we can genetically encode new amino acid functions and express proteins containing these amino acids in bacterial, yeast, and human cells.